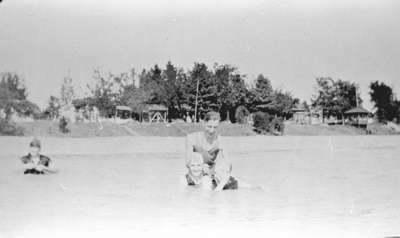 Black and white negative of a photograph from the Worfolk family album of a boy and a girl swimming in Lake Ontario. Heydenshore Park is visible in the background. Hazel Worfolk is the woman in front of the unidentified man. Heydenshore Park was a summer resort established around 1900 east of Whitby Harbour. A number of cottages were built there starting in 1900 and were demolished in 1965 when the private park was sold to the Whitby Public Utilities Commission. In 1971 Heydenshore Park was sold to the Town of Whitby. Swimming in Lake Ontario at Heydenshore Park, 1921, unknown photographer, Whitby Archives, 12-001-037.